“You’re always in the Garden; every hour is not the darkest hour” says one pastor to another during one of their private conversations that is part-therapeutic, part-evaluative. The former, played with a masterfully restrained vigor by Cedric Kyles (otherwise known as Cedric the Entertainer), is the extroverted leader of a prosperity-gospel megachurch in upstate New York called Abundant Life. As its spiritual and business leader, he is concerned with growth and outreach as much as preserving the physical edifice of the church itself and its position in the community. 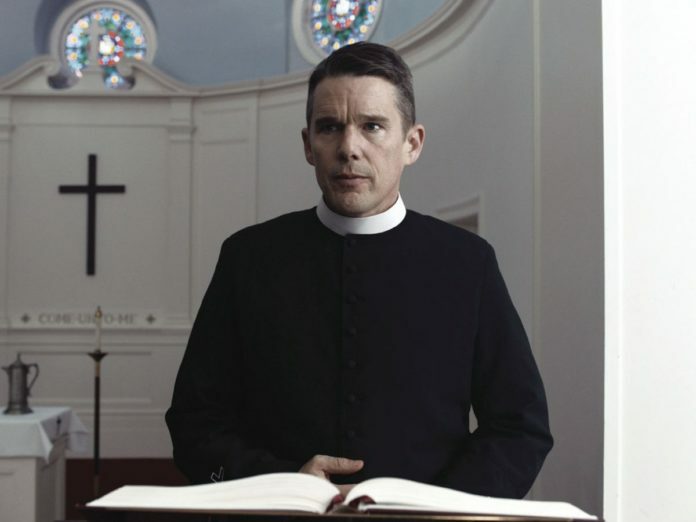 The latter, played by the equally mesmerizing Ethan Hawke, is the introverted minister of a tiny Dutch Colonial on the other side of town called First Reformed, and he is consumed by physical and spiritual crises that have contributed to his deeply sequestered existence. Writer-director Paul Schrader settles comfortably back in his old territory of characters isolated by their own grief, guilt, addiction, or ruination to create a harrowing look at contemporary faith and activism, action versus passivity, and hope in its bleakest state. Reverend Toller (Hawke) runs little more than a tourist attraction, as the First Reformed church pulls in more tour and student groups throughout the week than parishioners on Sunday. The whitewashed building is a historical site about to celebrate its 250th anniversary, and the local bigwigs have big plans to publicize its commemoration. It used to serve as a stop for the Underground Railroad; now, visitors stop by the gift shop as they leave. Toller doesn’t like this pantomime of an existence, but he doesn’t fight it much. Since losing his adult son in Iraq years before (where he was also a chaplain), his wife has left along with much of the desire to act on his increasingly fragile faith. His residence, adjacent to the sanctuary, is Spartan in its furnishings and stocked with more alcohol than food – kudos to Grace Yun’s production design and Nadya Gurevich’s set direction that creates cavernous voids out of the smallest and biggest interiors. Within these structures, Toller remains immersed in the grief of his past actions and regret over their consequences, exacerbating the internal rot that is spreading through his body as both a flagellation and race towards death as reprieve. To him, there is nothing left on Earth that can bring him joy or peace, not that he would deserve any if there were. Traces of Schrader’s earlier work are evident here, from Toller’s narration of his diary entries reminiscent of Travis Bickle in “Taxi Driver” to the wretched self-absorption of Wade Whitehouse in “Affliction” and even the cageless loneliness of Julian Kay in “American Gigolo.” The cinematography of First Reformed (richly shot by Alexander Dynan) evokes the same icy bleakness of Affliction as blood and brains on gray slush rival the rusted carcasses of ships jutting out of waterways on the edge of town for juxtaposition of despair and corruption. In a fully absorbing performance, Hawke plays Toller as a man of routine and self-denial; his diary alternates between confessional and almost congratulatory in his sacrifices. He refuses medical treatment for a disease that will eventually kill him, brushes off the concerns of Jeffers (Kyles), and shuns the advances of a well-meaning music director at Abundant Life (Victoria Hill). His life stopped at his son’s death. All he has now are the motions. The catalyst arrives as he is called to counsel a deeply troubled young man named Michael (Philip Ettinger) who desperately wants to hear what Toller has to say, but not for reasons Toller expects. Michael is an environmental activist and his research into not only the long-range effects of contemporary pollution decades from now but also what cannot be reversed because of damage in last century has layered his fear from the nexus of his unborn child extending outward to the world in which the later adult will have to exist. Michael wants his pregnant wife, Mary (Amanda Seyfriend) to get an abortion to spare the child from the degradation of the planet and thus society, and his meeting with Toller is almost a challenge to see if he can present an alternative solution. As Toller responds, it is clear from Michael’s distraught face that he has his answer. What Schrader does best is show his characters inching forward through their flaws and transgressions — often through precarious mental states — and with Toller confessing of an endpoint in his diary, we see his physical and mental breakdown alternately thwarted or exacerbated by taking up Michael’s cross and connecting with Mary, who believes in the life within her and its place in the world. As Toller delves into Michael’s work, he rejoins the living so to speak, and the corruption of the environment by a local corporation, headed by Edward Balq (Michael Gaston) becomes his new focus. Balq is underwriting the entire 250th anniversary celebration of First Reformed, and the insidious nature of the man and his company compounded by the near-zealous confidence he has in his community agenda, pose an increasing threat to Toller’s physical, spiritual, and mental foundations. Masterfully, both Schrader and Hawke mold Toller into a grotesque crusader, as we are never sure if he is working for the glory of God or himself. Will Michael’s cross be a holy, selfless mission or one of personal passion for a man who has nearly fetishized suffering? By the time Toller and Mary share a metaphysical journey, we have already traced his spiritual path enough to sense an impending catharsis, though this does not bring comfort. Rather, has his self-immolation reached such a fever pitch as to be undeniably selfish?